The 88 Project, August 13, 2018: Huynh Thuc Vy, a prominent blogger and co-founder of Vietnamese Women for Human Rights, is under investigation and facing possible prosecution for “offending the national flag,” a charge under Art. 276 of the 1999 Criminal Code (Art. 351 of the 2015 Code) which carries up to three years in prison. She was detained for 15 hours for questioning on August 9, after having ignỏred previous summons. Police came to her home in Dak Lak province to confiscate personal items such as cellphones and books and take her away for questioning, without any search or arrest warrants. She is banned from travel until October 9. The action that is under investigation is allegedly her spraying paint on the national flag (pictured above). Huynh Thuc Vy herself has clear views on the reasons for her action, which, for her, is just a peaceful expression of her dissent, and thus, is protected under international law of human rights. Below is our translation of a post on her Facebook, in which she elaborates on the intent of her action, as well as her analysis of what the government is really trying to do in restricting her freedom of movement for the next two months: preventing her from participating in and gathering people for potential protests that would happen during that time frame. I’m not someone who is concerned about the issue of flags. Building democracy, protecting freedom, and promoting human rights require specific cultural, economic, legal, and political institutions; political symbols themselves do not play any role (the flag is one such symbol). I am a dissident; besides writing political commentaries criticizing the government, I find that I should take advantage of every means of resistance to express my views, as long as it is peaceful and complies with international human rights law. Vietnam is now under the authoritarian rule of the communist party. Therefore, the symbols of this party obviously became sacred and inviolable charms that support their oppression of the people’s spirit, besides the political and economical oppression. Therefore, in my consciousness, the red flag symbolizes oppression and dictatorship. Resisting dictatorship obviously means resisting all of its symbols. Being a dissident, I findthat it is my responsibility to “violate” inviolable symbols. Ho Chi Minh is also an incantation of the regime. By now many people have desecrated this incantation, but twenty years ago it was inviolable in Vietnamese society. “Offending the leader” or “offending the national flag” is no different in essence. 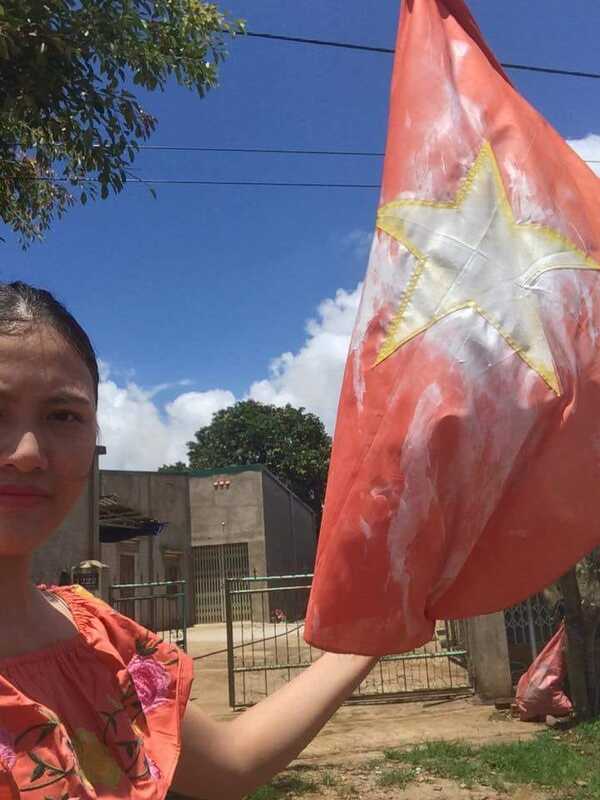 Vietnamese police use the charge of “offending the national flag” to continue deceiving the people about the sacredness that they want to maintain for the symbols of the communist party. Citizens and even dissidents will continue to avoid clashing with this sensitive symbol and will keep acquiescing to the red flag, which means continuing to support the oppressive policies of the authoritarian State. If any of you think that I’m foolish in getting involved in the flag issue, which then leads to prosecution, you would really look down on all of my efforts to fight for freedom and human rights over the past ten years. The government is taking this flag case as a pretext to suppress my connection with the Montagnards and prevent me from gathering patriots in the area of Ha Lan A, where I’m living, during the possible protests in the near future. There is always an excuse for jailing us. Many others have been imprisoned without getting involved in the flag issue, haven’t they? My activity is not just a tiny action of spraying paint on the flag, is it?